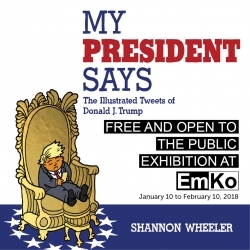 Palm Beach, FL, December 29, 2017 –(PR.com)– American Cartoonist, Shannon Wheeler, launches My President Says exhibition at EMKO, in West Palm Beach, Florida. The display will open up in January 10, 2018 on the third floor of the art gallery, located at 2119 S. Dixie Hwy, West Palm Beach. The exhibit presents Shannon’s illustrations from his newest book, a collection of our current president Donald Trump’s tweets. Wheeler collects, curates, and transforms Donald’s tweets into detailed cartoons, offering a glimpse into his desires, fears, and obsessions. He created them to help understand Trump’s perspective, and how it resonates with his supporters. They undoubtedly reveal Trump’s contradictions, leading the viewer to question reality, and further understand the mind of whom we elected. Shannon Wheeler is an award-winning cartoonist from Berkeley, California who draws cartoons for the New Yorker, MAD, and the Onion. Wheeler first attended Walden Center and School, then Berkeley High, and eventually gradated from the University of California with a degree in architecture. He’s best known for his satirical superhero creation called Too Much Coffee Man staring in a minicomic. Shannon now resides in Portland, Oregon with his two twins. Wheeler’s art collection, My President Says, is now available at Barnes & Noble, Target, and Amazon. You may find more of Shannon’s personal work and information on Twitter @MuchCoffee or on his online cartoon website at www.tmcm.com.